I loved the concept of this recipe but in all honest it really wasn’t something I cared for in the end. I was hoping for a more true pretzel flavor but that's not what these taste like to me. 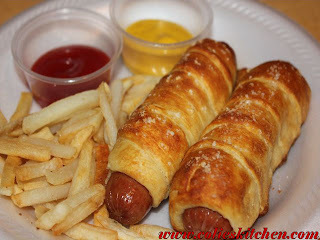 I thought they just tasted like a hot dog with a breadstick around it LOL!! The rest of my family on the other hand loved these “hog dogs from heaven” as my husband called them. If you are looking for something fun to include your children in this recipe would certainly be a way to go. It’s hands on for children of just about any age, and what child doesn’t love a good hot dog? They certainly make a nice presentation that's for sure!! It is the weekend after all so why not whip up a batch and make even the kid at heart happy? Bring a large pot of water to boil. Once boiling, add hot dogs and boil for 3 minutes. Once hot dogs are cooked, allow to cool enough to handle. Carefully ladle out 1 cup of boiling water into a bowl big enough to fit hot dogs. Add baking soda and stir until dissolved. Wrap each hot dog with one bread stick, twisting it around. Leave a 1 inch space at each end. When hot dogs are wrapped, carefully dip each into water mixture being sure to cover. Place on baking sheet and sprinkle with sea salt. Bake for 10 minutes, checking after 5. Bake until browned on top, but watch carefully because can easily burn. Serve with spicy ketchup on side.